Marta is using Smore newsletters to spread the word online. The song "Caga tió" is an easy song based on simple rhymes as they were created and sung by children. There are lots of different lyrics chaning some sentences. You will learn about the different lyrics on this document. 1) It's an easy song so it won't be difficult for you to learn its lyrics. 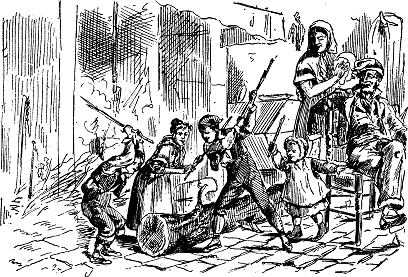 2) It's a very traditional song in our country and everybody in Catalonia knows it. A song that we sang for Christmas when we were children and we all remember this song with joy. 3) Also, we think that you would find this tradition funny. In English we translate "Caga Tió" as Christmas Log. 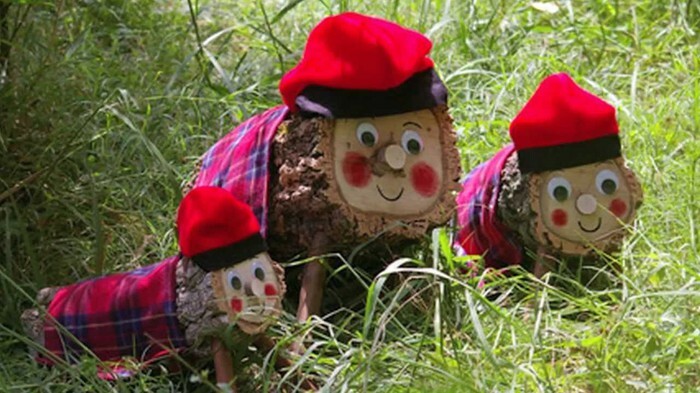 In Catalonia it is just known as Tió (trunk or log, a big piece of cut wood). The tradition has centuries of history. At the beginning, it was linked with nature and fertility. Tió has its origin in the farms where it was seen as a meaning of wealth: an old log gives from inside sweets. After celebrating the feast, they burnt Tió and spread the ashes through the fields, around the house and above the bed as a symbol of good luck and fertility. 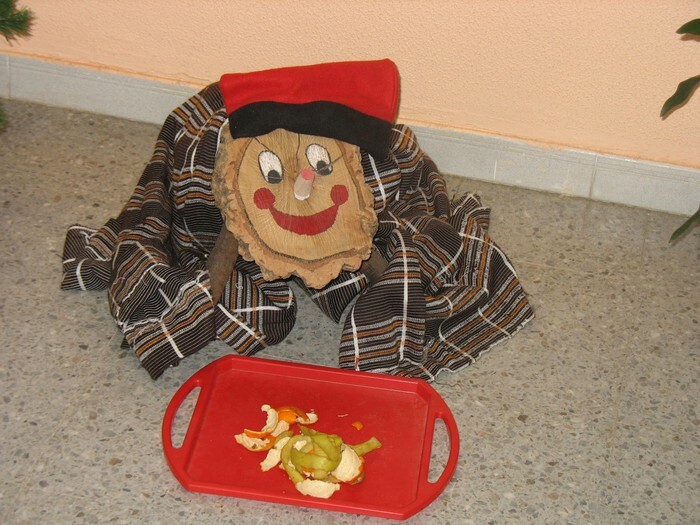 The beginning of the feast is on December 8 with Immaculate Conception: Tió appears in the house and one gives Tió a little bit to "eat" every night and usually covers him with a blanket so that he won't be cold. The story goes that in the days preceding Christmas, children must take good care of the log, keeping it warm and feeding it with fruit and some biscuits. This way, Tió will poop presents on Christmas Day. On Christmas Day or, in some houses, on Christmas Eve, one prepares Tió and orders it to defecate. 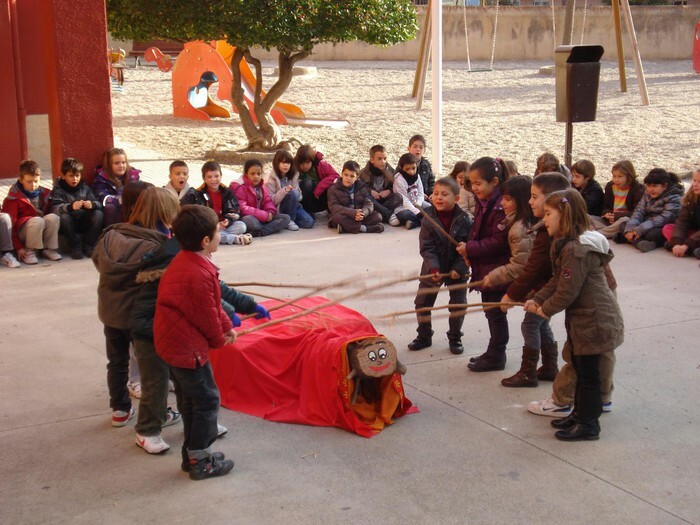 To make it defecate, children beat Tió with sticks while singing the traditional song that here we present you. The tradition says that before beating Tió all children habe to leave the room and go to anotehr place of the house to pray or sing Christmas sons, askig for Tió to deliver a lot of presents.This makes the perfect excuse for parents or relatives to do the trick and put the presents under the blanket while the kids are praying. Usually, Tió doesn't drop larger objects, as those are considered to be brought by the Three Wise Men. It does leave sweets, torrons (=nougats), clothes and small toys. It's typical that Tió leaves different presents as children sing many times. The last time that Tió drops something, it is often something to eat and share with all the family such as nougats and chocolates. Caga tió, d'avellanes i torró. et donaré un cop de bastó! as they are too salty! I will hit you with the stick! You can play the score with a recorder o a piano. Children learn to play it with a recorder when they are at primary school.